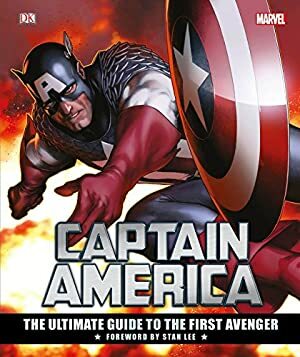 Vamp is a very minor Captain America enemy, who first sashayed in in 1978. She didn’t appear much, even though her abilities were distinctive. I thought that she was cool back then. Admittedly, I was kinda young. Though her biography is short, this profile has a lot of technical discussion. Her powers are interesting to model. Other Aliases: “Annie-Muss” (because the Hulk is bad at names). Group Affiliation: Former Corporation operative, former member of a S.H.I.E.L.D. super-agents program. Height: 5’6″ (6’5″ as Animus). Weight: 125 lbs. (310 lbs. as Animus). Eyes: Violet (black as Animus) Hair: Black (none as Animus). The Falcon (Sam Wilson) as he taught the S.H.I.E.L.D. super-agents. Her training seems focused on unarmed combat. A black belt in judo was mentioned, but she seemed also proficient with harder techniques such as kicks. Perhaps her qualifications are actually in jujitsu ? In any case, she’s markedly more skilled than even a specially trained but still rank-and-file S.H.I.E.L.D. operative. Furthermore, she is unusually fit and attractive. Her pain tolerance seems so-so considering her training, though she was better at recovering from pain than at withstanding it. Baranger also seems to have robust people skills, including acting, persuasion and infiltration. She’s observant and intelligent. Increase her physical strength to match that of her opponent. Increase her speed and athleticism to match that of her opponent. Allow her to duplicate the fighting skills of her opponent. This seems particularly handy when disarming said antagonist. However, this is limited. Only opponents within a short range can “feed” the belt, and its output is limited. For instance Vamp can’t increase her strength to massive superhuman levels (secondary sources state a “Class 10” cap). And she only seemed able to replicate a portion of Captain America (Steve Rogers)’s speed and skill, as the belt couldn’t endow her with Cap’s experience. Her durability also doesn’t increase to match her strength. This is a clear concern if she strikes hard surfaces whilst endowed with great brawn. Curiously, I don’t think that this technology was seen again. Thus, it is possible that Vamp had certain physiological properties that allowed her to use the absorbo-belt. Superhuman strength (more about it latter). The ability to emit psionic repulsor beams from his forehead. Telekinesis . This was for instance used to warp railroad tracks to derail a train, or to take control of Cap’s shield and “wield” it as an agile, flying projectile. Telekinesis used to take control of machines. The Animus famously turned a compact car into a surprisingly agile killer, that could chase Captain America even indoors. The wheel, pedals and stick were likely operated through simple TK, but the Animus could also see from the car’s point of view. Telekinesis to animate bulk matter. The Animus animated a large stone statue to make it a sort of golem. He latter made the floor rise and encase the Hulk for about two minutes (!). Teleportation. It would seem that this was done remotely by Corporation systems. But since they didn’t teleport other agents, the Animus must have something that facilitates this. Perhaps there are remotely-controlled cybernetics that block the Animus’ teleportation power unless his Corporation handler allows it. Like the Vamp form, the Animus form is an adept melee fighter. He’s particularly proficient at batting away projectiles with his club. However, Animus clearly isn’t as supple and mobile as the Vamp. Animus can’t use both his psionics and his physical moves at the same time. He needs a second or two to refocus when alternating between mental and physical manoeuvres. The strange crystal club that Animus wields holds much of its psionic energies. It is also what enables the transmutation from Vamp form to Animus form. The Animus’ pain tolerance seemed mediocre. If the Animus strains too much or is in too much pain, he will apparently pass out. This allows Baranger’s consciousness to take over, but she doesn’t seem able to operate the Animus body. She even speaks in her Vamp voice rather than with the Animus’ voice. However, she *can* use the Animus’ telepathic and teleportational powers. In Marvel handbooks , the Animus is at first estimated to have “Class 100” strength, then later on “Class 25”. That’s quite a difference. But when analysing the fights, “Class 100” seems about right for the Hulk fight, whereas “Class 25” is a possibility for the Captain America fights (but a markedly highballed one). 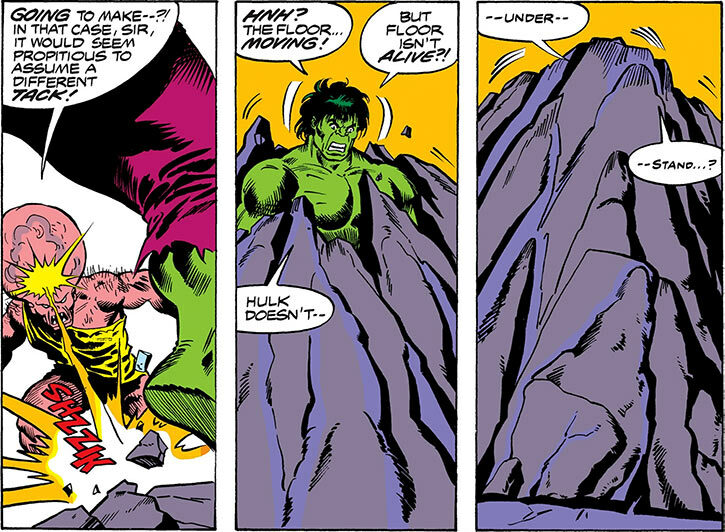 One notices that the Animus is *much* stronger when fighting the Hulk than when fighting Cap. He’s also far more durable. Cap could reduce the Animus to cringing helplessness with a barrage of punches, yet the Animus remains standing and fighting after the Hulk body-checks him. At that point, the Hulk is about 15,000 times stronger than Cap ! This is a job for… a No-Prize Hypothesis ! Our game stats assume that the Animus’ club can replicate the strength and durability of his opponents. Essentially, the club is a more powerful version of the absorbo-belt. Albeit a more specialised one, only doing raw brawn. This cleanly models all his fights, whilst keeping extraneous entities to a minimum. Vamp couldn’t turn into the Animus on her own. The transformation was triggered by a sort of remote control. What this means is unrevealed. She could be a mutant or mutate needing technological help to assume her superhuman form. That’s the most economical hypothesis, and this ability would resemble that of Manikin (Whitman Knapp) or Evolvo. The transformation could also be artificial, as with DePrayve (Winston Redditch) or Mister Hyde (Calvin Zabo). Secondary sources mention genetic engineering, but IMO that doesn’t seem likely. Denise Baranger found the Animus’ club, perhaps in a Thor-and-Donald-Blake scenario. 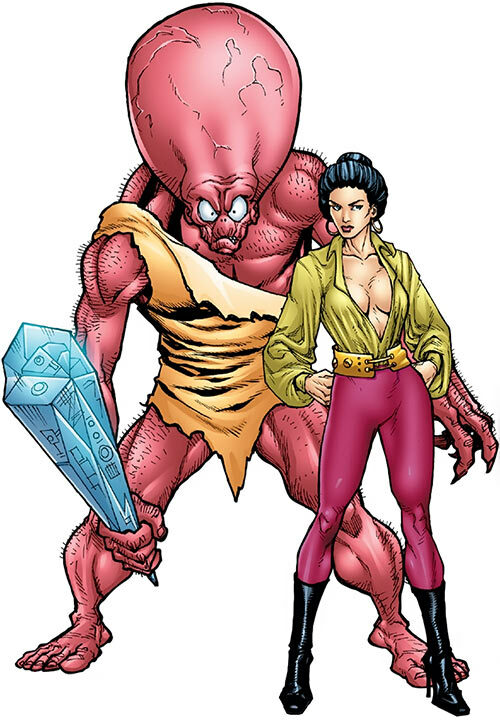 Holding the club slightly mutated her, to allow for a transformation into an alien entity called the Animus. Corporation scientists then came up with the basics of the absorbo-belt technology. It was based on analysing the alien club. Baranger infiltrated S.H.I.E.L.D. in a low-sec position. Then the Corporation leaked absorbo-belt components toward S.H.I.E.L.D..
S.H.I.E.L.D. scientists soon determined that only rare people could make an absorbo-belt work properly. They searched the personnel databases for a candidate. This likely resembled their work to turn Wendell Vaughn into Marvel Boy. And thus Baranger was soon promoted to a high-sec position as the bearer of the absorbo-belt. Bingo. Don’t forget to teep your waiter ! A Corporation agent mentions received telepathic orders “spoken” in a woman’s voice. This likely meant the Vamp – or at least Captain America thought so. The Animus also once telepathically contacted Kligger. A likely scenario is that the Vamp turns into the Animus to initiate telepathic communication. However this likely requires a strong focus and/or is painful, meaning that the Animus teeps in Baranger’s voice. With her outfit, we simply must have one of the greatest vintage disco tunes. We MUST. They were competent enough to take on S.H.I.E.L.D., which is no mean feat. However, they tended to betray each other and to be too ambitious. Thus, the Corporation was only around for a few years. Decades later there was an attempt at reviving the #brand, but that didn’t take off. Denise Baranger was closely aligned with one of the big men of the Corporation – Senator Eugene Kligger Stivak. She was his lover, a field-capable Corporation agent, and apparently a major superhuman asset as Animus. Super-agents, where are you now ? The Texas Twister (Drew Daniels). *Both* Vamp and the Blue Streak were Corporation plants, gathering inside S.H.I.E.L.D. intelligence. This greatly facilitated Corporation ops against S.H.I.E.L.D.. It even forced S.H.I.E.L.D. to abandon facilities in an effort to determine the source of the leaks. 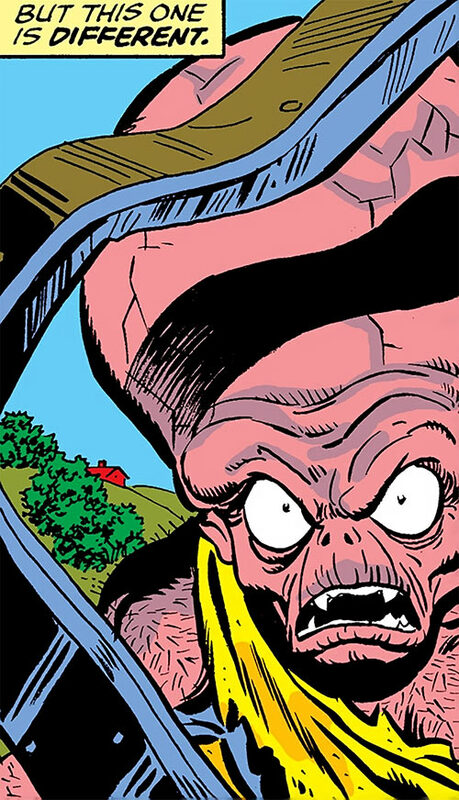 The Corporation also used Baranger’s telepathic talents to untraceably communicate with super-mercenaries. Nick Fury wanted to code-name her “Femme Force”, after an old experimental unit commanded by Sharon Carter and Valentina Allegra de la Fontaine. But Baranger refused. She had him code-name her “Vamp”, apparently as an homage to the character archetype in old movies. Nick Fury wanted to recruit Captain America to head this team, but Rogers refused. Instead, it was agreed to have the Falcon (Sam Wilson) start training the team, and perhaps lead them once they would be ready. However, the Falcon soon went missing. Taking psychic control of a VW Beetle to try and run him over… in his apartment (!). Animating the world-famous statue at the Lincoln Monument to fight Cap. As hoped, Rogers was unnerved by his opponent being President Lincoln (and by not wanting to damage one of his favourite statues). But he nevertheless prevailed. Directly confronted Cap right after that. But though he clearly was outpowered, Cap quickly defeated the Animus using experience, speed and smarts. Derailing the Metroliner train , which likely killed or seriously injured dozens. The goal was to confront Cap, who was aboard. Furious, the star-spangled Avenger soon noticed one of Animus’ weaknesses and defeated him. The Animus’ teleportation was activated just in time to prevent Cap from badly mauling him. Telepathically ordering the Constrictor to delay Captain America. Minutes later the underground base the two were fighting in exploded, as the Vamp knew it would. But Cap narrowly survived and saved the Constrictor. 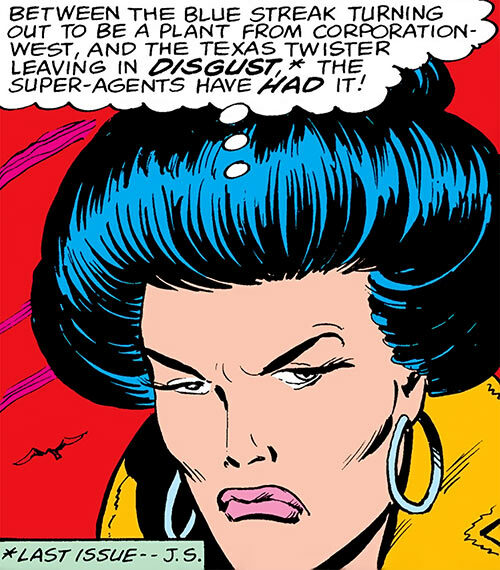 The last attempt strongly implied that there was a traitor amidst the Super-Agents. Thus, Cap stormed the S.H.I.E.L.D. base where the Super-Agents were training. Then he bluffed, claiming that he had proof that one of them was a traitor. Blue Streak and the Vamp tricked the whole team into attacking, but Cap prevailed. Unnerved, the Blue Streak exposed himself as a traitor and was stopped by Cap. The Vamp pretended to overreact and severely beat the Blue Streak, but Cap prevented her from “accidentally” killing him. Incensed, Texas Twister left S.H.I.E.L.D..
Blue Streak revealed that the Falcon had been kidnapped by the Corporation and was held on Alcatraz Island. 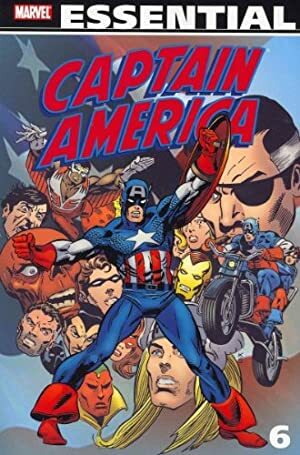 Accompanied by the Vamp and Marvel Boy, Captain America invaded the secret Corporation base there. However, they found themselves at the Corporation’s mercy as the Falcon was held hostage. At this point, the Vamp broke her cover and joined Kligger. Captain America and Marvel Boy nevertheless attempted to fight, and were joined by the incredible Hulk (long story). Vamp beseeched Kligger to activate her Animus metamorphosis before it was too late. She seemed to have a better understanding of what the Hulk could do than her lover did. It worked. A joint surprise attack by the Animus and Moonstone took down the Hulk for a little while. When the Hulk recovered, Animus encased him in solid matter. However, the Hulk eventually broke free, and Captain America, the Falcon and Marvel Boy attacked. Moonstone fled, leaving Animus to fight the Hulk. The Hulk destroyed the Animus’ club, which forced the Animus to revert to Vamp form. Baranger was left severely stupefied. The Vamp was still badly shocked when S.H.I.E.L.D. agents came in to mop up. One thug was about to strike her for being a traitor when Captain America physically intervened. 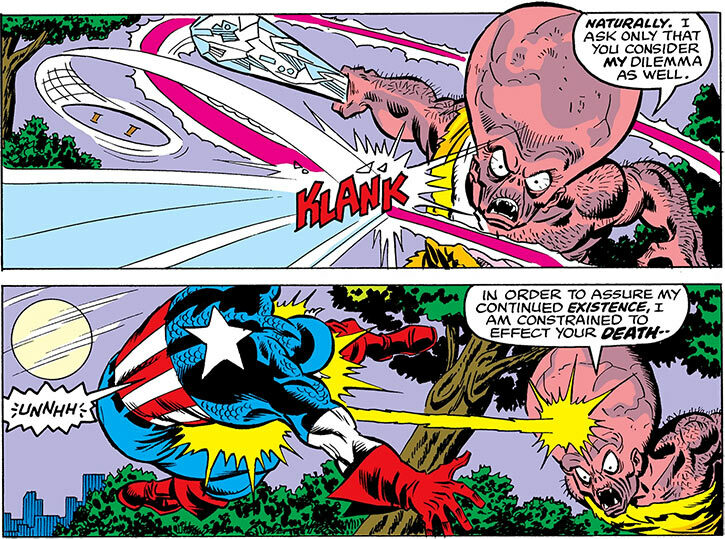 After he forced the agents back, Cap helped Baranger out of her prostration. He then escorted her to a S.H.I.E.L.D. hospital. The Vamp eventually got free. Perhaps she recovered faster than expected, and escaped. She reputedly then became a minor criminal in the Midwest, far from most super-heroes. In 1986, she attended a meeting at the Bar With No Name. The Scourge of the Underworld had been murdering minor costumed criminals, and a score of these were organising to strike back for their own safety. However, a Scourge operative had infiltrated the meeting, and opened fire with a special .50 firearm. The patrons were reaped by the gunfire. When Captain America was taken to the scene by the Water Wizard, the corpse of the Vamp was clearly among the victims. The Vamp’s costume is archetypal of late 1970s discotheques. Flashy open silk shirt with puffed sleeves, high-waisted disco pants, long hair worn in a high bun but without being drawn tight. She was born to be, she was born to be, aliihiiive ! Baranger seemed to be brash, yet crafty and devious. She also was proud of her martial skills, perhaps to the point of overconfidence. She certainly liked trash-talking her opponents, especially if they seemed to underestimate her. The Vamp tended to come across as cold, pragmatic and slightly bitter. The main exception was her being sweet toward Kligger. But she seemed to have contempt toward the other Super-Soldiers, clearly thinking that they weren’t as cool as her. Vamp seemed to crave becoming Animus and to feel the rush of power this form represented. One remark of hers may imply that she liked old, silent movies. And her fashion choices may mean that she was a disco fan. The Animus seems to be a completely different person. He speaks in an elaborate, eloquent, polite manner. He appeared embarrassed to kill people, explaining that he considered this terrible but had little choice. He implied that he had to follow the Corporation’s orders or die. Yet he also was oddly worked up about killing his opponents, growing excited and craving their death. Perhaps the Animus had some sort of bestial killer instinct that was normally kept in check by an advanced, ethical intellect ? Furthermore, when the Animus was battered his speech patterns, body language, facial expressions and voice reverted to those of Denise Baranger, even though it was still the Animus body. It is of course possible that the Animus persona is something that the Vamp is role-playing to protect her triple identity. But that seems less likely. Kligger: “Very well, my dear — the power is yours !” (hits a button on a Kirbyesque remote, turning the Vamp into the Animus). Lessee, what happened in 1978 at DC… Ah yes, the Implosion . Perhaps Vamp and Animus were notable foes of Firestorm, but were lost in the fray when the book was cancelled ? Like Silver Deer. The Animus also resembles the Future-Man (bloke wot fought Supergirl). Perhaps he’s an equivalent coming from another Earth, where the Future-Man is the alter-ego of an unpowered Linda Danvers rather than of Barry Metzner. That’s she’s clad in green and purple also strongly suggests working for the pre-Crisis Lex Luthor. Perhaps her absorbo-belt is far more powerful, but turns her into the Animus if she duplicates too much power from Superman ? Familiarity (Espionage, Military procedures and equipment), Rank (Unrevealed Rank within S.H.I.E.L.D.). Alter-Ego (50 pts – must be authorised by the Corporation), Secret Identity (x2). None of the Enhance scores can bring the wearer’s scores above the highest score of any person within a 2 APs Range. So if nobody in range has more than, say, STR 04, the effective cap for Enhance (STR) is 04. Some “general agent training” stats are speculative due to insufficient material. Inf: 04 Aur: 04 Spi: 03 Wealth: N.A. Earth Animation, Ice production, Interface, Mental Blast are all Contingent Upon Telekinesis. Earth animation – see below. Ice production – see below. Interface is Ranged, but is limited to devices with external controls (wheel, pedals, trigger, buttons, etc.). Telekinesis can be Combined with Mental Blast, but if so Telekinesis can only be used for a Planned Knockback Attack. Telepathy has a Special +12 Range Bonus. Teleportation must be authorised by the Corporation. Insta-Change (includes making his club appear). Alter-Ego (50 pts – must be authorised by the Corporation), Distinct Appearance, Secret Identity, Minor Rage, MPR (see “Cartesian duality” below), Traumatic Flashback (taking 3+ RAPs, even if LDDed). The club has its own section just below so it’s easier to read. BODY 16, Recommended STR 05. The cap for (Enhance) STR cannot be higher than the highest STR value of any character within a 2 APs Range. The cap for (Enhance) BODY cannot be higher than the highest BODY value of any character within a 2 APs Range. Enhance (STR) and Enhance (BODY) both bolster the wielder, not the club. The OV/RV bonus when using the Block Manoeuvre is 2 APs (4 APs vs. ranged attacks). The OV bonus for the Shield Cover Manoeuvre is 2 APs (4 APs vs. ranged attacks). When using mental powers (everything but Growth), the Animus cannot take any other Action, of either kind, during that Phase. Among other things, that means that he cannot move. The Animus cannot instantly switch from a physical action (such as using his club) to a mental action (such as using a mental power). There’s a perceptible delay between the two. This is a 06/06 OV/RV Perception check for a Character observing the Animus in battle. This check can be done as an Automatic Action. It is possible to exploit this small delay, if it was noticed. However, this is only feasible for a Character who has the Initiative over the Animus, and employs an appropriate tactic. 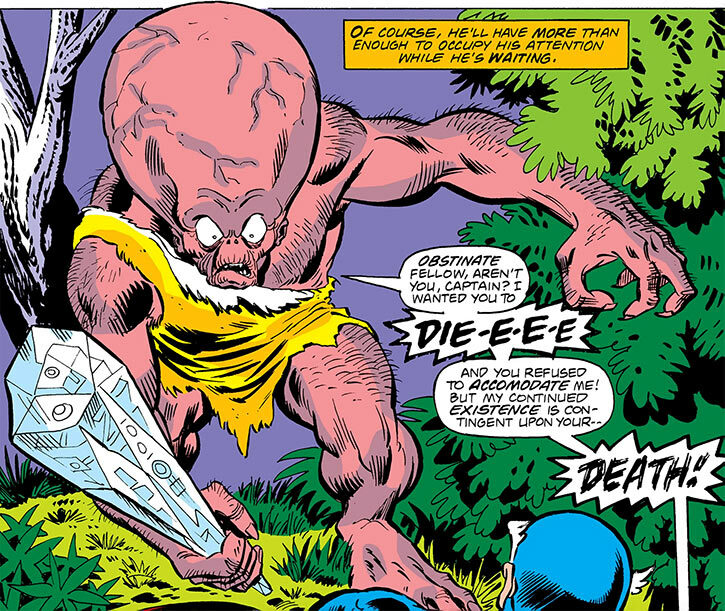 In Cap’s case it was quickly hurling a rock at the Animus then rush him. The Animus was unable to mentally stop Cap as he had just used his club to bat the rock away. Such a tactic will lower the OV of the Animus by 1 CS against the next Action, or raise the Animus’ next action’s OV by one CS, depending upon its nature. This can be done as many times as desired. If the Crystalline Techno-club is wrecked (reduced to a Current BODY Condition of 0), then the Animus is immediately incapacitated, and reverts to being Denise Baranger during the next Phase. The Vamp will be badly shocked and will have considerable difficulty doing anything other than curling into a ball. She certainly won’t be able to conduct any Dice Action in days. It seems that the destruction of the club made it impossible for the Vamp to ever become the Animus again. The Animus did state that the club was “the power source”. It has been theorised that the Vamp might be able to learn to manifest the Animus on her own. However, one assumes that she would need some sort of power source (perhaps worn as a belt for tradition’s sake). The Animus’ Earth Animation Power can only be used on objects with a suitable shape and size, such as a large statue. The Animus doesn’t have the fine control to reshape a lump of matter in an Animation. The Animation based on Lincoln’s statue had the following Attributes: DEX 09 STR 10 BODY 05 Skin armour: 02. This statue is 28′ tall (8.5m), which is Growth: 05. A smaller animation would likely have lower STR, and almost certainly lower DEX (which is derived in part from the giant statue’s reach and stride) and BODY. Intuitively I’d say DEX 06 STR 05 BODY 03 Skin armour: 02 for a man-sized statue. The APs of Earth Animation assume that the Lincoln statue was the biggest that the Animus could animate. That is, its STR is equal to the Power’s APs (whereas DEX and BODY are lower due to Limitations to the Animus’ Earth Animation Power). But I wouldn’t be surprised in the least if Animus could animate something bigger, perhaps 12 or even 14 APs. The Animus’ Ice Production Power can only be used for the “encase” application. Furthermore, it can only be used if the target is currently standing on a solid surface (usually meaning the ground). This is because the Animus is telepathically animating the ground to encase the target. If the target attempts to break free, the OV/RV is limited by the BODY of the material that the ground is made of. The Walls table on BoH:SE p. 177 should help, with ordinary topsoil having a BODY of 03. However, if the Animus is pumping Hero Points into the EV of Ice Production, each AP thus gained can be added to the maximum OV/RV of the “break free” roll. This represents piling on larger amounts of material than normal. Howbeit this is only works for dense materials such as metal or stone. Thus, the Animus could burn lots of HPs to raise the maximum OV/RV for the Hulk to break free to 22 (12 APs as the BODY of the steel than was under the Hulk, plus 10 APs for having maxed out the EV of Ice Production using HPs). By contrast, attempting this against Captain America would have made little sense. The AV is too low even with Accuracy, and Cap was standing on soil which was too loose and too low-BODY to have much of an effect. Writeup completed on the 22nd of December, 2017.